It’s official! Huawei has just started the pre-order for its P-series of smartphones exclusively on Daraz. Just days after the official international launch, the phones have already made their way to Nepal. A great level of promptness from Huawei’s side! Not only that but Huawei is also making the pre-booking experience a lot more exciting. But before we get into that, let’s take a quick look at what all the three phones have to offer. 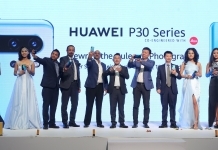 The Huawei P30 Lite is the more economical smartphone to be announced from Huawei. 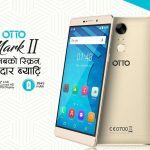 The phone for the Nepali market is priced at Rs 39,990. For the price, it offers a 6.15 inch Full HD (1080 x 2312) IPS LCD display. The notch makes an appearance, this time in a more compact water-drop format. And encasing the internals of the phone is a glass-on-glass design sandwiched by a metallic frame. Under the hood, the P30 Lite packs an octa-core Hisilicon Kirin 710 processor along with the Mali-G51 MP4 GPU. The SoC is backed by 6GB of RAM and 128GB of internal storage. These combos are great inclusions for the price! 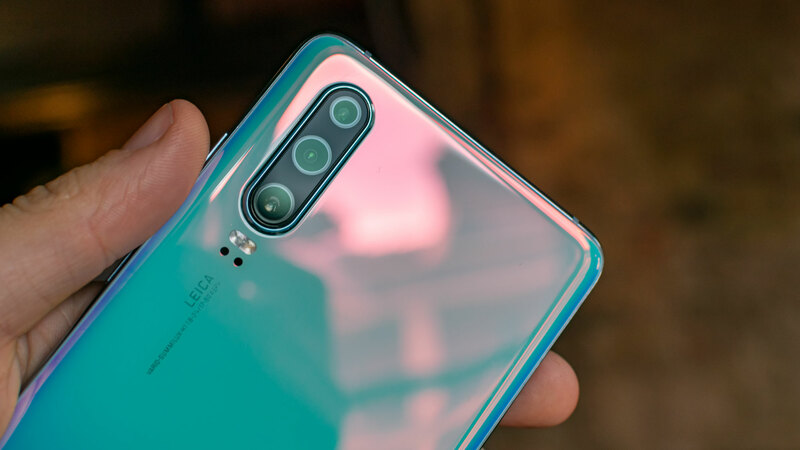 In the optics department, the Huawei P30 Lite packs a triple rear camera set up made by an f/1.8 24MP, f/2.2 8MP, and an f/2.4 2MP sensors. 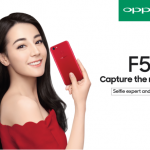 It also comes with an f/2.0 32MP front-camera for all your selfies. And sitting below the rear cameras is a fingerprint scanner embedded into the phone’s back panel. Moving on, at the software side of things, the P30 Lite runs EMUI 9.0 based on Android 9.0 Pie. And finally powering the device all up is a 3340mAh non-user removable battery. Adding to that is the inclusion of the 18W Fast Charger and USB Type-C port. 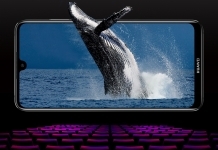 The Huawei P30 packs a 6.1 inch Full HD (1080×2340) OLED display with a 19.5:9 aspect ratio. The notch makes an appearance but in a new water-drop style design. And encasing the internals of the phone is a glass-on-glass design sandwiched by a metallic frame. Under the hood, the Huawei P30 packs an octa-core HiSilicon Kirin 980 processor along with the Mali-G76 MP10 GPU. The SoC is backed by 8GB of RAM and 128GB of internal storage. The memory of the phone can be further expanded via a micro-sd card up to 256GB. In the camera side of things, the P30 packs a rear triple-camera set up made by an f/1.8 40MP wide, f/2.2 16MP ultra-wide, and an f/2.4 8MP telephoto lenses. It also comes with an f/2.0 32MP front-camera for all your selfies. The phone comes with a fingerprint scanner now placed neatly under the display. Moving on, at the software department, the Huawei P30 runs EMUI 9.1 based on Android 9.0 Pie. The phone is also IP53 rated for dust and splash resistance. And finally powering the device all up is a 3650mAh non-user removable battery. Adding to that is the inclusion of 22.5W SuperCharge Technology and USB Type-C port. All these offerings come for a price tag of Rs 84,900 here in Nepal. 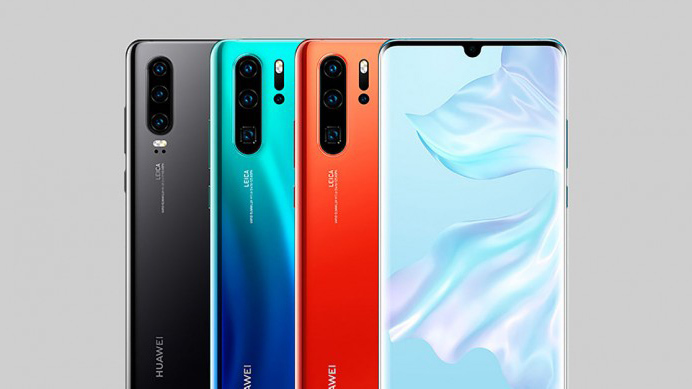 The Huawei P30 Pro is the true flagship among the three! It offers the best any smartphone has to offer for a price tag of Rs 1,19,900. For the premium price, the phone first and foremost packs a 6.47 inch Full HD (1080×2340) OLED display with a 19.5:9 aspect ratio. The panel this time around is almost bezel-less with an 88.6% screen-to-body ratio. That is great for a phone sporting a water drop style notch. Under the hood, the Huawei P30 Pro packs an octa-core HiSilicon Kirin 980 processor along with the Mali-G76 MP10 GPU. 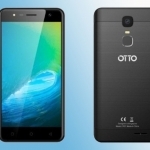 The SoC is backed by 8GB of RAM and 256GB of internal storage. The memory of the phone can be further expanded via a micro-sd card up to 256GB. 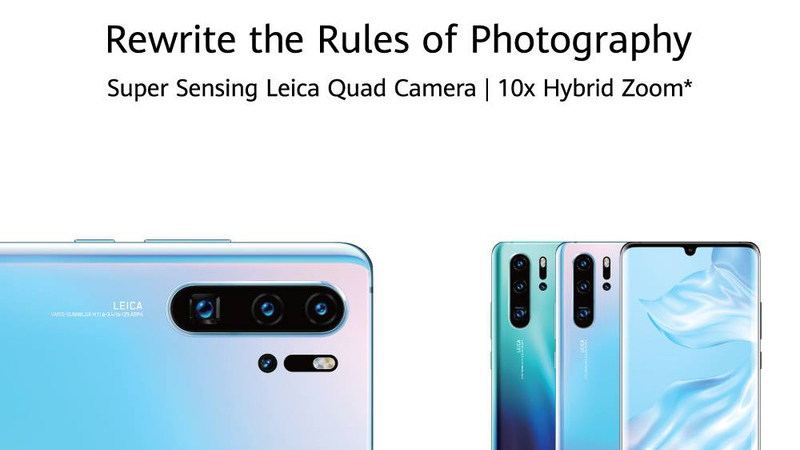 In the camera department, the Huawei P30 Pro packs a quad-rear camera set up made by an f/1.6 40MP wide, f/2.2 20MP ultra-wide, f/3.4 8MP Periscope telephoto, and an f/3.4 8MP TOF sensors. It also comes with an f/2.0 32MP front camera for all your selfies. The phone comes with a fingerprint scanner now placed neatly under the display. Moving on, at the software side of things, the Huawei P30 Pro runs EMUI 9.1 based on Android 9.0 Pie. The phone is also IP68 rated for dust and water resistance up to 2 meters. And finally powering the device all up is a 4200mAh non-user removable battery. Adding to that is the inclusion of 40W SuperCharge Technology, Fast Wireless Charge, Reverse Wireless Charge, and a USB Type-C port. The Huawei P30 series is now officially in Nepal. You can pre-book any of the three phones from the 31st of March to the 7th of April exclusively on Daraz. Huawei also has some exciting gifts for the customers who pre-book the phones. 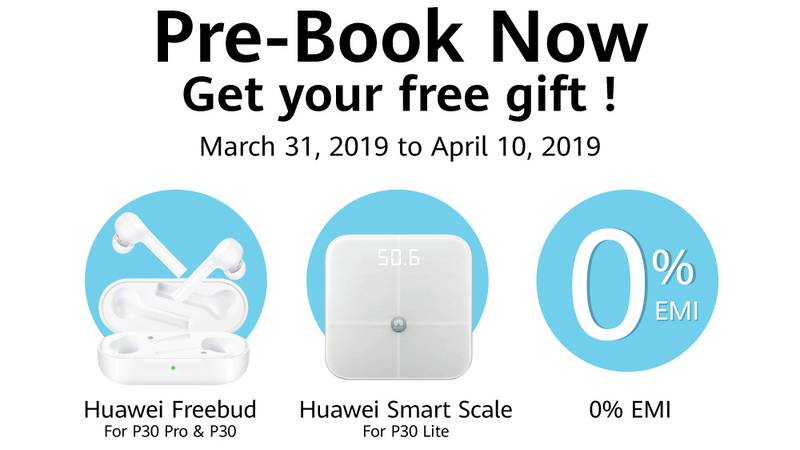 People ordering the P30 Lite will get a Huawei Body Fat Scale while P30 and P30 Pro pre-bookers get a Huawei Freebud. 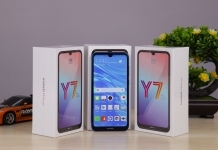 A compelling deal on Huawei’s part! Huawei also is providing EMI services at 0% for those wanting to purchase the phone a bit more economically. To know more about the EMI services visit a Huawei showroom near you. The aforementioned service is available for customers of Nabil Bank, Machhapuchchhre Bank, Mega Bank, Kumari Bank Siddhartha Bank, Global IME Bank, Century Bank, NIC Asia, NMB Bank, and Nepal Investment Bank. Thank you for reading! For more interesting news on the Huawei P30 series in Nepal, like our Facebook page and subscribe to our Youtube channel. If you have any questions or confusions, please feel free to ask them in the comments section down below. We will answer them as soon as possible.